The winter months can be brutal in Michigan. It’s cold. It’s snowy. It’s icy. It’s dark. The sun rarely peeks out from behind the clouds. I love the warm weather so at least once a year, probably around January or February, I fantasize about moving somewhere warmer and curse myself for living in the cold. The problem with this line of thinking is that moving somewhere warmer probably wouldn’t make me any happier. The research on the focusing illusion backs me up on this when Daniel Kahneman sought to answer the question: Are people who live in California happier than others? Kahneman and team studied two groups — one from the miserable Midwestern climate and the other from sunny California. Of course, they discovered that Midwesterners despised their weather while Californians enjoyed theirs. But climate had no impact on well-being as there was no difference whatsoever in the life satisfaction of the two groups. Basically, we place too much weight on one factor such as weather and too little weight on the other aspects of our lives that impact well-being. Permanent changes to circumstances in your life don’t have much of an effect because after the initial rush it becomes commonplace and you get used to your new surroundings. Certain things in life are initially exciting but eventually lose their appeal. My response to this stat was that money is great and all but you could make the case that the majority of young bitcoin millionaires will be worse off for it in the end. 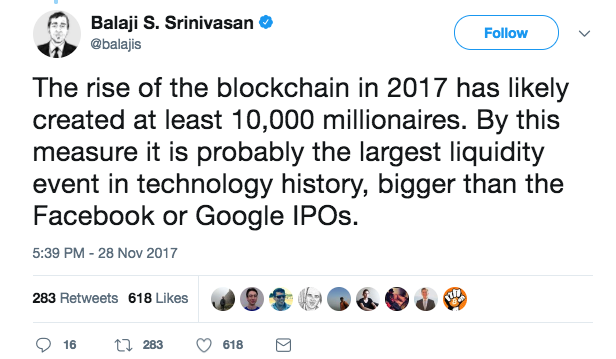 I have a feeling most of these millionaires were already rich (hence the risk of putting money into this space early on didn’t matter too much to them) but I’m sure there are a handful of newly minted rich young people who fortuitously timed the rocket ship that is cryptocurrencies. I received some pushback on this so I wanted to explain myself. Making tons of money at an early age is probably a combination of the best and worst thing that can happen to you. It gives you tons of possibilities but also opens you up to potential problem situations if you’re not equipped to handle it. Research shows about 70% of people who receive a financial windfall will lose it within a few years. It’s estimated that nearly 80% of NFL players are broke or bankrupt after being out of the league for two years. Sixty percent of NBA players are broke after being out for 5 years. One of the biggest problems with becoming wealthy, especially when it happens really fast, is that people become overconfident and assume wealth equals better decision-making ability. If anything, more money often causes people to make worse decisions. Success early on in life can also give you a false sense of intelligence or skill. Personalizing successes sets people up for disastrous failure. They begin to treat the success as a personal reflection rather than the result of capitalizing on a good opportunity, being at the right place at the right time or even being just plain lucky. The high from “being right” the market and making all that money is unbelievable. It cannot be duplicated with drugs. You are totally invincible. You are impervious to all pain. There’s nothing bad in the world. Making a huge sum of money in a short period of time produces such a rush because you have no time to adapt to it. You can just as easily make money mistakes when you’re steadily saving over time but you don’t get the same dopamine hit when you have time to adapt to that money as it builds over the years. Obviously, more money is better than less money. I’m not disputing this fact. Money can solve many of life’s inconveniences and minor stresses. But it can’t solve everything and it’s promised to no one that money will lead to a happier or more fulfilled life. Don’t let your wealth define you or own you because it won’t help your well-being as much as you think. Don’t allow wealth to own you. Count your blessings and show gratitude on a regular basis — this will make you happier than the money. There will always be people richer than you. Accept this as a fact of life and don’t dwell on the circumstance of others. One of the hardest things to do in life is to be satisfied with what you have. Again, becoming wealthy is a good thing but you have to bring the correct attitude if you wish to hold onto that wealth.